PoPville » Panel discussion on the 150th anniversary of DC Fire & EMS at MLK Library Wed.
Panel discussion on the 150th anniversary of DC Fire & EMS at MLK Library Wed. 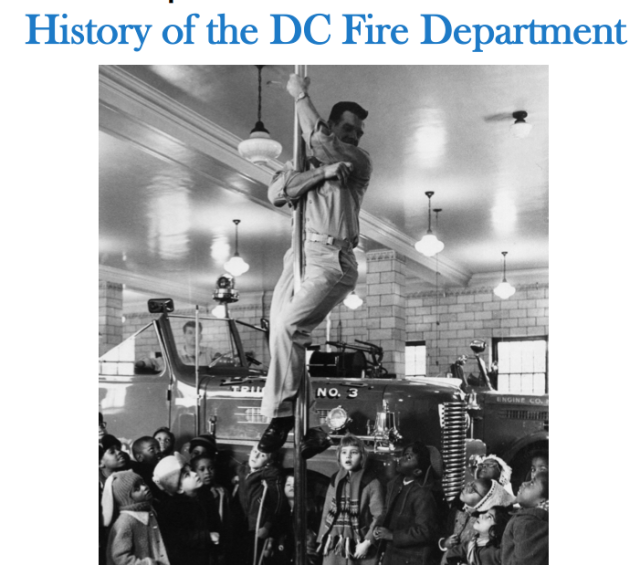 Please join the staff of the DC Fire & EMS Museum in the Washingtoniana Room (Room 307) on Wednesday, July 9, 2014 at 6:30 p.m. for a panel discussion on the history of the DC Fire & Medical Emergency Service Department. Historians Jim Embrey, Jim Lloyd, Mark Tennyson and Walter Gold of the DC Fire and EMS Museum will discuss 150 years of firefighting in the District, including its establishment as a paid department, segregation and integration of the force, and its critical role in the community. Photos and stories from DC’s biggest fires will be featured. Be sure to stop in the Great Hall lobby to see a multimedia exhibit on DC Fire history. The exhibit features photos from the Special Collections Prints & Photographs Collection and historic fire equipment on loan from the DC Fire & EMS Museum. Fires to Remember, a slideshow produced by the Friendship Fire Association, is also on view in the Great Hall through mid-July.